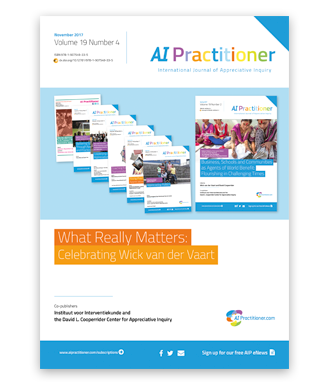 FREE access to the latest issue of AI Practitioner “What Really Matters: Celebrating Wick van der Vaart”. All articles by Wick van der Vaart, published earlier in AI Practitioner or in other books and magazines. Nourish yourself with Wick’s Wisdom and use his practical insights as practitioner. Some people close to Wick van der Vaart share what he meant for the people he worked with. The Feature Choice is by Roopa Nandi and the Research Notes by Susan Gee, Tracey Hawkes and Julia Bergman. Keith Storace is responsible for Voices from the Field, this time with Ann Hilbig. Fill in the form to receive the pdf to download. Yes, I want to get the FREE issue!